Oxford Film Festival Take 5 With...: Take 5 with "Dear Father"
Take 5 with "Dear Father"
As we gear up for the Oxford Film Festival 2012 to be held at the Malco Studio Theater on Feb. 9-12, 2012 and also at the Lyric Theater on Saturday, Feb. 11 as part of the Oxford Music Festival line-up where we will show music films, videos and a panel on music + film, we thought we might introduce you to some of the people behind the movies we can't wait to show you. For the full schedule and description of the films, visit www.oxfordfilmfest.com. 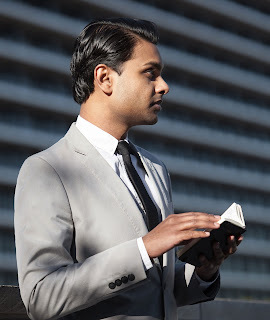 Meet Take 5 filmmaker Adnan X. Khan, director of "Dear Father." Q. 1: In 140 characters or less, describe your movie and why someone should see it. A: In "Dear Father" a stranger reveals his alienation from the world and longing for spiritual transcendence in six letters to his loved ones. The film is for anyone curious about new and unconventional ways to experience a story. Q. 2: Biggest lesson learned in getting the film made? Best part in getting the film made? A: At its most basic level, filmmaking is a way to get to know yourself better. Every film is a snapshot of your mind at the time you had made it — a film represents your craftsmanship and skill, but also how you feel about the world and how you understand its mysteries at a particular moment in your life. With "Dear Father", my second short film, the experience was not only personal but also instructive in the sheer force of will needed to get a film made! Artistically, it reaffirmed an important lesson: never compromise. Q. 3: Tell us about you. What is your movie making background? A: I am a director and cinematographer based in Los Angeles. I was born in Pakistan to Catholic parents and raised in the United Arab Emirates. My unique multicultural background informs my strong interest in questions of identity and spirituality in the modern world. I moved to California to study film and graduated from Columbia College with a BFA in Cinema. Art history, literature and music motivate my filmmaking style which has been affectionately described by peers as daring and formally rigorous! Q. 4: What's your dream distribution plan for the film? A: Distribution that allows more people around the world to experience the film. Q. 5: What does the future hold in store for your film and for you? A: As a director, I am currently in pre-production on my first feature film, "Three Temptations", to be filmed in California during the spring of 2012. As a cinematographer, I will photograph a cerebral sci-fi drama for Spanish director Germán Izquierdo Valero before the end of summer. I am also finishing a new script. The Oxford Film Festival was created in 2003 to bring exciting, new, and unusual films (and the people who create them) to our city.